The CEHW instrument team added a new planet-finding spectrograph to its portfolio today, as NASA announced they have selected the Penn State-led team to build an Extreme Precision Doppler Spectrograph to provide next-generation exoplanet observational capabilities to the entire astronomical community. 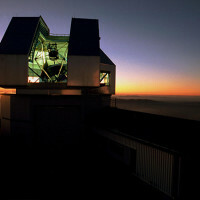 The spectrograph will be deployed in 2019 on the 3.5-meter WIYN Telescope at Kitt Peak National Observatory in Arizona. A multi-institutional team led by Penn State was one of two finalists in a global competition to design the $10 million instrument, and was selected after a comprehensive design review. The instrument will be named NEID, which means “to see” in the language of the Tohono O’odham tribe, on whose land Kitt Peak National Observatory is located. CEHW has launched a new NEID website, where we will document the development of the new instrument. Please visit us there, and stay tuned for future updates!